Currently in Moab. (12/10) Didn't really see myself getting to much of the country this winter but turns out the opportunity presented itself. 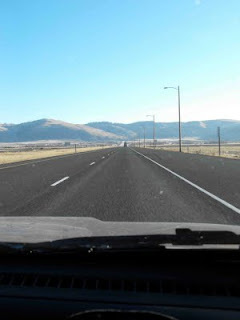 Last week I flew to Washington State and started the drive out to Denver. What a great section of the country! The landscape is wildly different from the lush autumn of Ohio that I left. Endless skies, different color schemes, and significantly higher speed limits have all been pleasant surprises. Speaking of speed limits, we're currently at the mercy of an '87 Subaru. I'm sold. It had some issues before we took off, obliging us to stay in Washington an extra day or two but for a car that's almost as old as I am, she's doing great. And mom and dad can rest easy knowing we couldn't max out in Idaho where 85 was slow. 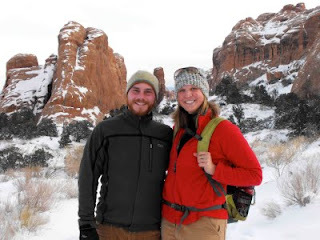 Moab is a great town! 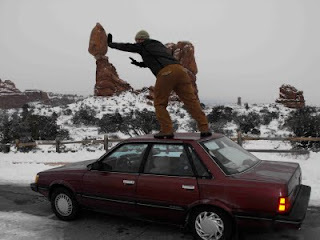 Winter rates on everything and the snow gives a great contrast to the rust red sandstone that attracts fat tire enthusiasts and climbers. Rafting and touring companies abound and I'd love to get back in the fall when it's not too hot to really use the landscape. 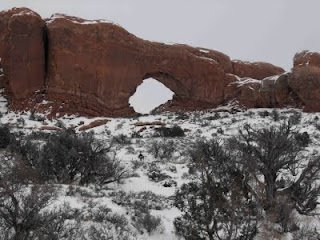 Arches National Park is here and we took a day to check out another one of Mother Nature's wonders. What an incredible sight to behold. Pieces of rock have simply fallen or melted away leaving gardens of rock formations and graceful forms framing the sky. Wish we had more time but we're on a bit of a time crunch to get to Denver where Peace Corps friends and famous margaritas await. Speaking of bevys, Moab microbrewery is recommended as much for the food as the booze. A hummus plate, beer cheese soup, black bean soup and house salads more than filled us up. On to Denver!